My painting has evolved over the years, from an impressionistic, representative style, to a synthesis of abstraction and figuration, with occasional dips into pure abstraction. I use abstraction to convey mood, tensions and feelings through colour, the material and form of paint on canvas or paper. Colour has always been extremely important to me. It was in my studio in Edinburgh that I developed my own particular ‘voice’ in painting. I like to make a satisfying synthesis between abstraction and figuration, placing narrative skills like drawing within a more or less abstract structure- usually a kind of loose grid. A recurrent theme is landscape under threat because I care so much about conservation of the environment and reducing pollution in all its insidious forms and because I love being ‘close to Nature’ as the Greeks say. This means literally being out in the countryside but also conveys that ancient sense of holding nature sacred. A need for reverence towards the earth and its manifestations of life is at the heart of my work. ‘Halcyonic Gulf‘ is a picture of this idyllic gulf which lies over an earthquake fault line, so it is threatened not only by manmade pollution, but by natural factors too. Yet, at the moment it is still a place of mostly unspoilt Greek beauty and tranquillity. 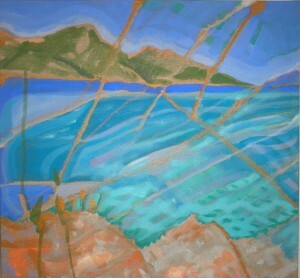 Reflections on life are reproduced metaphorically in my painting, showing relationships between things. 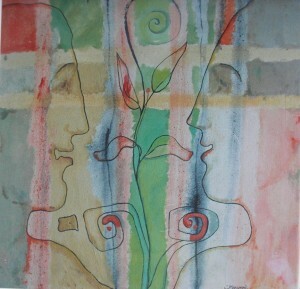 For example, the subject matter of some paintings, like ‘Neighbours’ or ‘Flowering’ (see below) is an image of the distances and connections between people as they relate to each other, with reference to ancient Greek pottery drawing, where the expressive use of line and spacing can convey humour, love or prejudice etc but always in connection to each other. In a lot of archaic (around 500BC) Greek pottery decoration there is a wonderful sense of freedom in the drawing but the overall design is balanced harmoniously within the restriction of the shape of the vase. The dripped lines and grids resulting from my process of painting also take on a symbolic meaning: that of the values and prejudices that are built into our vision of life, acting as a framework to understanding but also as limitation. In ‘Flowering‘, between the profiles of the couple I have drawn a plant, whose leaves and flowers fit perfectly the space between the pair, reflecting the shapes of their profiles and their harmony with nature. It symbolizes both the flowering of their relationship and their part in the natural scheme of life. 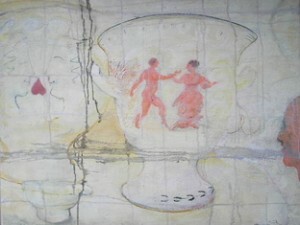 It is influenced by ancient Greek pottery drawing. Picasso, Matisse, Manet, Leger, Late Turner, Paul Nash, John Houston, Barbara Rae, William Gillies and other Twentieth Century Scottish Artists, ancient Greek pottery circa 4-500 BC.